This church is one of the oldest existing church worth visiting in Nagcarlan, one of the towns on the southeastern part of Laguna. Laguna is just 30 kms south of Manila. The church has been built with lighter materials wayback the 15th century, and has been renovated in 1752 after it caught fire. Reconstruction was done in 1845. One thing making this church visited by many is the famous big old bell up the belfry. Local movie shoots are being held up the belfry as well, and I was just too curious to see that bell being famous because of the local TV series "kampanerang kuba" shooting scenes up there that became popular in the Philippines. Climbing up the stairs going up the belfry might be challenging to some particularly the oldies :). 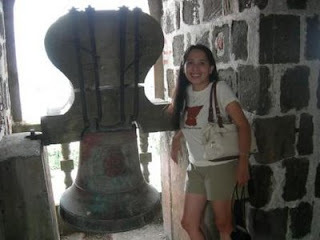 Well, I was huffing and buffing when I finally got the chance to reach and see the bell. 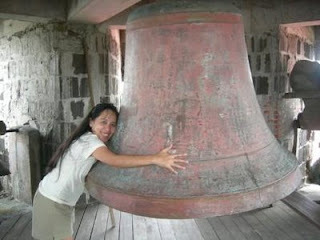 It's all worth it, so I deserve to ge a hug of the bell lol!